Chicago's official Christmas tree is sparkling in its new home in Millennium Park. 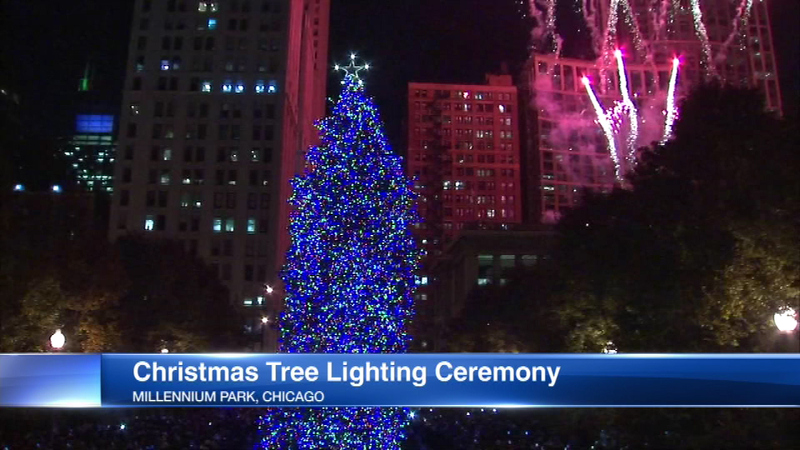 CHICAGO (WLS) -- The city of Chicago is accepting nominations for the official Christmas tree in Millennium Park. The Department of Cultural Affairs and Special Events is accepting nominations until October 20. The family of the selected tree will get to switch the tree on at the 104th Annual Christmas Tree Lighting Ceremony on November 17. The nominated trees must be at least 55 feet or taller, be located less than 100 miles from Chicago's Loop and preferably be a spruce or fir tree. Pine trees are ineligible because they are not sturdy enough. Submissions must include the owner's name, address, phone and email and at least two photographs, one from afar and one up close as well as a brief description of why the tree should be Chicago's official Christmas tree and background information on the tree. Nominations can be emailed to DCASE@cityofchicago.org or by mail to Department of Cultural Affairs and Special Events, ATTN: Christmas Tree Contest, 78 E. Washington Street, Chicago, IL. 60602. For more information, visit cityofchicago.org/dcase.